Heroin addiction treatment has become a public-health necessity in recent years. It is the process through which patients who are addicted to heroin overcome their dependency, find their way to recovery, and rebuild their lives. The National Institute on Drug Abuse (NIDA) reports that from 2005 to 2015, there was a 600 percent increase in annual heroin overdose deaths in the United States. The Centers for Disease Control and Prevention (CDC) reports that heroin abuse has doubled among Americans eighteen to twenty-five. Heroin is one of the most addictive and dangerous illicit drugs. Over half a million Americans are battling heroin addiction, according to the American Society of Addiction Medicine. The drug affects practically every portion of the United States, from teenagers to young adults to senior citizens, and has grown in popularity over the past few decades. Heroin addiction is, by all accounts, a medical disease that requires long-term care just like diabetes, heart disease, hypertension, and cancer. What Does Effective Heroin Addiction Treatment Look Like? Medical Detox. Heroin creates serious and lasting changes in the brain’s chemistry and the central nervous system that makes users pursue the drug to the detriment of everything else in their lives. These profound changes must be corrected with the help of an experienced and qualified team of medical experts who are trained to treat the symptoms of heroin withdrawal. Detox usually lasts around five to seven days and helps patients overcome acute symptoms. Behavioral rehab. Heroin addiction treatment must also include comprehensive behavioral rehab to help patients better understand the psychological elements of their heroin abuse and develop relapse-prevention techniques. Rehab is usually comprised of group therapy, one-on-one counseling, and a specialized combination of occupational therapies, which will vary according to a patient’s care needs and their facility’s resources. NIDA reports relapse rates for drug addiction at 40 to 60 percent. This means long-term interventions include ongoing psychiatric therapy, medication-assisted treatment (MAT), and sober-living facilities for those seriously affected with little or no support system. At the start of heroin addiction treatment, patients can expect to feel a variety of physical and psychological withdrawal symptoms. By the time addiction takes hold, the body has become dependent on the drug to feel normal, and users are forced to use higher dosages at more frequent intervals to feel the same effects they experienced during their first time using. Heroin withdrawal is divided into three stages: early, acute, and protracted. These symptoms should be managed by a team of medical experts who are trained in treating heroin and opiate withdrawal and who can intervene in case of a medical emergency. Inpatient. Patients stay at a residential facility for the length of their treatment program (twenty-eight to thirty days on average), so they can concentrate on getting well and overcoming their dependency. Longer-term residential programs can last anywhere from ninety days to six months and often offer a sober-living transitional option for patients who need help beyond inpatient treatment. Outpatient. 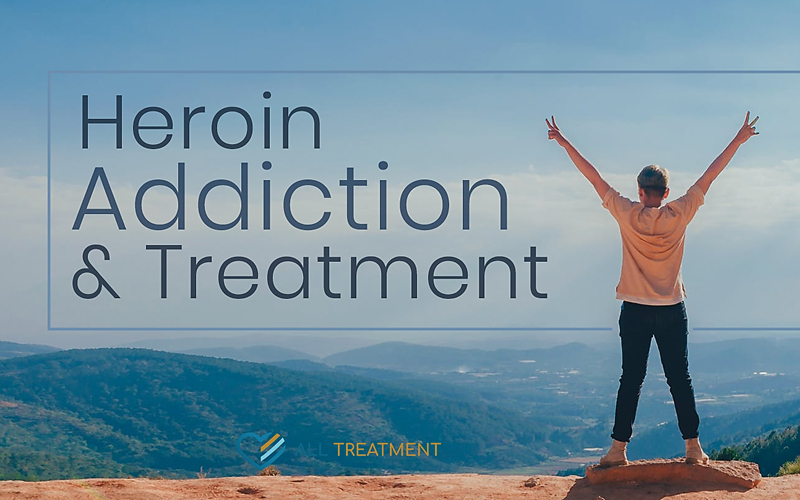 Outpatient heroin addiction treatment allows patients to attend regular treatment sessions multiple times per week, ranging between two to three months. These programs allow patients to get the help they need while maintaining their careers, family connections, and daily obligations. Outpatient programs are ideal for patients with limited substance use history and a solid and strong support system in their everyday lives. Intensive Outpatient – Intensive outpatient (IOP) programs provide the same flexibility and resources as regular outpatient treatment but for a longer period of time and at more frequent intervals. IOP is ideal for patients with a more prolonged and extended history of heroin addiction who don’t have the means, time, or ability to seek help at a residential facility. IOP and regular outpatient treatment programs are significantly more affordable than their inpatient counterparts. Costs of programs will vary according to each facility’s resources, staff, and scope-of-treatment services. There are also longer-term programs that can last for months or even years. Methadone. This opioid-based medication sold under the brand-name Dolophine® is used to treat pain and in opioid maintenance therapy. Methadone is dispensed at clinics under the trained eye of a medical professional. Length of methadone use is contingent upon the patient’s continued symptoms and cravings. Suboxone®. Suboxone is a brand-name drug for buprenorphine with naloxone. It comes in a sublingual (under the tongue) film or tablet for which, unlike methadone, patients can get a prescription from their doctor for independent use. The FDA recently approved the first generic forms of Suboxone, making the drug more affordable and accessible. Vivitrol®. Vivitrol is a once-per-month injectable form of naltrexone. Its slow-acting dispensation makes it hard for patients to divert or abuse while providing relief from symptoms and cravings. The World Health Organization (WHO) has designated buprenorphine and methadone as “essential medicines,” and NIDA says that MAT increases social functioning and retention in treatment while decreasing opioid use, opioid-related overdose deaths, criminal activity, and infectious disease transmission. MAT is not meant to replace any other aspect of treatment and should be deployed alongside behavioral care services like counseling and group therapy. Eligibility for MAT will be determined by the patient’s physician or treatment provider. Heroin addiction has become a pervasive and deadly public health issue with more and more Americans dying each year. To that end, legislators, clinicians, and other stakeholders are taking more and more steps to make treatment more affordable and accessible to patients who need it. States use Medicaid dollars and other means to fund state-run treatment facilities, and employer-based health insurance plans usually cover at least partial expenses for inpatient treatment. The admissions staff at your prospective treatment facility will offer comprehensive information on your options for paying for your treatment and help you determine if any assistance is available. The one thing you can’t afford to do is wait to get heroin addiction treatment. The longer heroin abuse continues without intervention, the more vulnerable you become to overdose. There are more options than ever to help you overcome heroin and rebuild your life. Rely on your support system to help you find a program that works best for your care needs and lifestyle. Whether you need inpatient, outpatient, IOP, or long-term treatment, the important thing is to start the process of reaching out for treatment. Get the help you need now.